The Rebirth Green Lanterns Vol. 3: Polarity does improve on a lot of what's plagued this book so far. 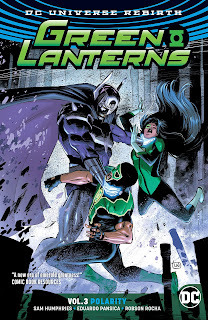 I still think Sam Humphries jocular Green Lanterns read a tad flimsy, but his characterization is head and shoulders better than before, both for Jessica Cruz and, especially in this volume, Simon Baz. Here, Humphries begins to get into the hangups that plague these characters specifically, going beyond the surface to aspects that differentiate these characters as individuals, and it makes for a much more involving read than this book has offered so far. Largely Polarity is Simon Baz's book, but Humphries kicks off with a one-issue Jessica story. Starting with Jessica's struggle to get out of bed in the morning, Humphries' spotlight here is considerably more detailed than any examination he's offered so far of Jessica's (generically named) "anxiety," including what methods she uses for self-therapy. The splash page by Miguel Mendonca of Jessica's doubts literally swirling all around her seemed a particularly cogent visual representation of what she experiences. I might still have liked to see Humphries take this farther -- where did Jessica learn her coping techniques, why or why not might Jessica seek professional assistance, etc. -- but this is better than before. I'm also glad that Humphries swiftly reversed Jessica's announcement in Green Lanterns Vol. 2: The Phantom Lantern that she was all better, explaining that as a symptom and not a fact. Though Jessica is around for the rest, the two-part Batman story and the three-part Dr. Polaris story are both largely Simon's. Here, Humphries offers Simon a lot of nuance -- that he carries (or carried) a gun along with his Lantern ring largely out of fear, and also that Humphries expands upon Simon's friendship with his brother-in-law. For the first time in this series we get a clear picture of Simon's former life as a criminal, and there's a lot of good drama in how Simon's new heroism has estranged him from his best friend and former partner-in-crime Nazir. These complicated familial relationships are true specifically to Simon, making for a story one couldn't just tell by slotting in Hal Jordan or Barry Allen. Further, Humphries does well spinning off from Justice League vs. Suicide Squad to parallel Dr. Polaris' efforts to save his own brother. The final chapter, with art by Robson Rocha, has a painterly, lushly colored appearance; the prolonged scene of Polaris' brother's death and Simon's attempt to save him is quite unexpectedly moving. Humphries achieves here a real sense of suspense, something this book has lacked, due in large part to making the proceedings uniquely relevant to the characters themselves. Also in this seven-chapter collection is an issue devoted to the evil entity Volthoom, currently masquerading as the Guardian Rami. I decried last time that Humphries seemed to just assume readers knew Volthoom's whole backstory, so this issue is welcome, though the placement is strange -- I do still think we needed this "times past" tale one trade ago. At the same time, with this in medias res flashback, Humphries seems to signal Volthoom as more than just a villain but instead an antagonistic supporting cast member. That too is something different and interesting for this book, precisely what it needs. Here as well, a deeper palette distinguishes the issue, with Rocha and Daniel Henriques on art. I do have a few nitpicks, including that Mendonca draws Jessica sparring a construct in the first chapter when Humphries has long since established she can't actually make them. We seemingly get the resolution of Simon carrying a gun, though Humphries has not done much with the fact that Simon has the gun up to this point. It would be more meaningful when Simon hands the gun over to Commissioner Gordon if we'd actually seen Simon use the gun anywhere in the past 17 issues, if Humphries had given any distinction to the idea that Simon carries a gun, or done anything but essentially ignored it until Simon gives it up. In contrast to the Nazir story, this is a "change" that really changes Simon not at all. And the whole Scarecrow story feels soft; we're meant to believe that by virtue of a moment's study the Scarecrow is able to harness the power of an absent Sinestro Corps ring, something that challenges what the audience knows about these rings but is true because the plot needs it to be so. Still, all of this is minor relatively, and from where this book has been, Green Lanterns Vol. 3: Polarity is a definite step up. I have enjoyed the fact that we have adventures of Green Lanterns on Earth again, of which perhaps Polarity, with a fight against stalwart Lantern villain Dr. Polaris, is the apex; I have been eager to see Jessica and Simon interact with the Green Lantern Corps, though it does appear that means they'll be off Earth for the next couple volumes, essentially through the end of Sam Humphries run on the series. I'm curious to see to what extent this book can still define itself if it turns into just another cosmic Lantern book; hopefully Tim Seeley and whatever writers follow can get the pair back on land soon.